Usually ERR_CONNECTION_RESET error occurs due to sudden changes done in internet connection. Personally, I had faced this error while switching from one WiFi network to another. Though, there are some other possible reasons behind this error. But, normally, this error occurs in Chrome Web Browser. So, it doesn’t matter which operating system are you using. 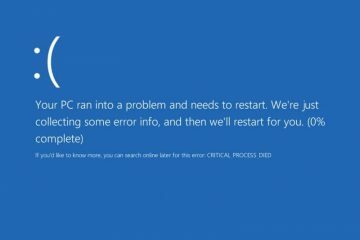 You can try to all solutions mentioned in this article to fix this error. When this error occurs, it doesn’t mean that, your internet connection has stopped working. Even, if you try to open the site in another browser. Then, you will able to access site. Browser is a medium, that works like a bridge between computer and web server. To fetch requested information. Once this error occurs, browser cache the error information. And, browser does shows error repeatedly, whenever you request for the web-page. So, the main cause behind this error is changes done in network settings. These network changes could happen, due to some third-party VPN software or extensions. So, by fixing all network and chrome settings, we can solve err connection reset error. 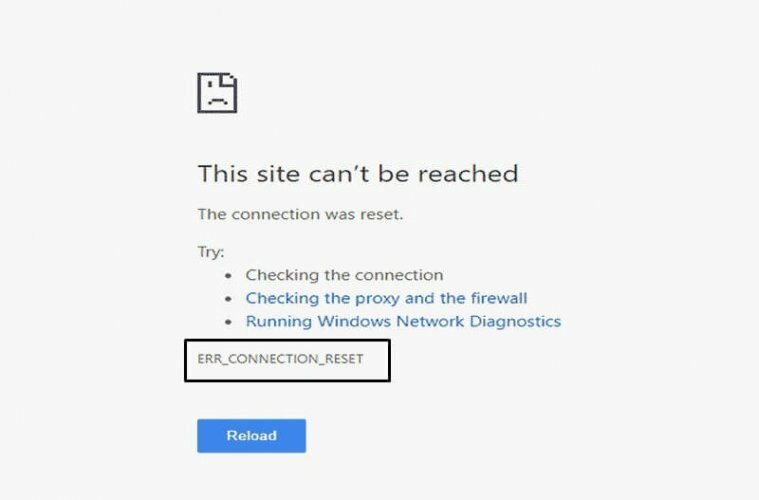 1 Solutions to fix ERR_CONNECTION_RESET Error in Chrome Browser. 1.1 Solution 1: Delete Chrome Host Resolver Cache. 1.2 Solution 2: Reset Chrome Settings. 1.3 Solution 3: Clear Browser Cache. 1.4 Solution 4: Reset TCP/IP and Flush DNS. 1.5 Solution 5: Change MTU size. 1.6 Solution 6: Check your proxy settings. 1.7 Solution: 7 Reset Winsock. 1.8 Solution: 8 Disable VPN. 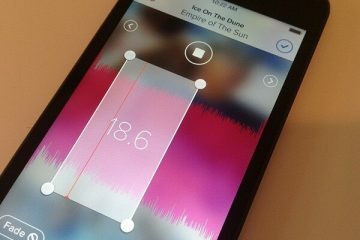 1.9 Solution 9: Disable WiFi MiniPort. 1.10 Solution: 10 Update Chrome and Network Drivers. Solutions to fix ERR_CONNECTION_RESET Error in Chrome Browser. IMPORTANT: Before trying out any of these solutions. Make sure your internet connection is working fine. If using LAN Connection, check cable is connected properly or not. And, if using Wireless Connection. Then, check internet in any Android Device. Solution 1: Delete Chrome Host Resolver Cache. This is the best and easiest solution to fix err_connection_reset error. To speed up browsing experience browser does cache some information. Host resolver helps to resolve Domain Name to an IP address using TCP/IP protocol. And, once it resolve, browser cache the information. So that the next time, browser doesn’t need to repeat the process. 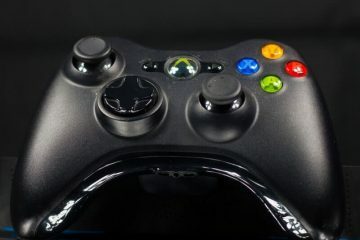 And, if the error occur once while resolving host. Then, due to host cache, error will come up again and again in that browser. Open the following URL in Chrome Web Browser. 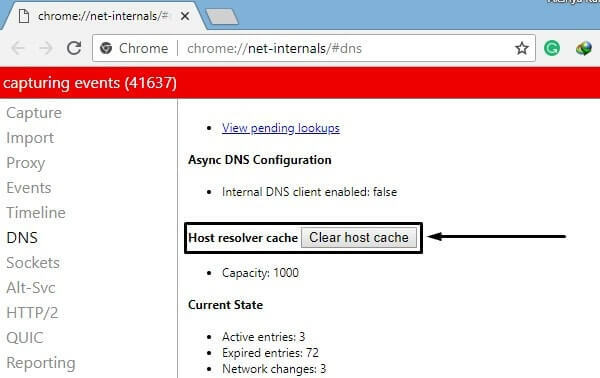 Now, you will able to see thousands of host resolver cache. You just need to click on “Clear Host Cache” to clear them all. Solution 2: Reset Chrome Settings. 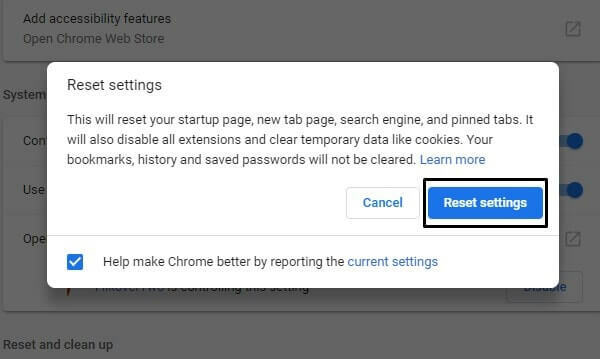 Resetting Chrome Settings will disable extensions and clear temporary data like cookies. It could possible that, due to some Chrome extensions this error is coming. And, if you can’t disable extensions manually. Then, this option will help you out. To directly jump on “Reset and clean up” page. Open the following URL in chrome browser. After that, Click on “Restore settings to their original defaults”. A popup will appear, click on “Reset Settings” option. Solution 3: Clear Browser Cache. If Host Resolver Cache not able to fix this error. Then, you need to clear cookies and other site data. To do that follow these instructions. Open Chrome Browser, And, Press Ctrl + H key simultaneously to open Chrome History Page. From the left side, Click on “Clear browsing data” option. A popup screen will appear on that same page. That’s it. Click on Clear Data button. 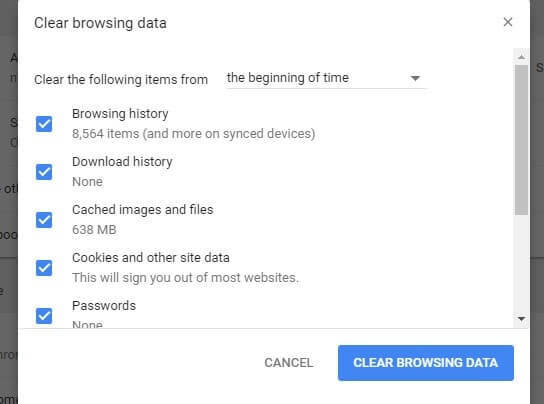 And, Within few minutes Chrome will delete all your browsing data. After that, Restart chrome browser. And, try to open the same site, which was showing “chrome err_connection_reset” error. Solution 4: Reset TCP/IP and Flush DNS. If after trying all these browser related solution problem problem still exist. Then, you need to reset TCP/IP. As I mentioned, TCP/IP protocol helps in resolving domain to IP address. So, by resetting and renewing IP, we can fix this error. 2. In Command Prompt, Run these commands in listed order. After running these Commands, hopefully, err connection reset error will get resolved. Solution 5: Change MTU size. Maximum transmission unit is known as MTU. It helps in determining the largest data size permitted on your internet connection. If your MTU size is too large for the active connection. Then, you might face dropping internet connection. And, then, err_connection_reset error occur for some sites. Note: Before changing the MTU size you need to figure out right MTU size for your connection. You need to perform a ping test to find out right MTU Size. 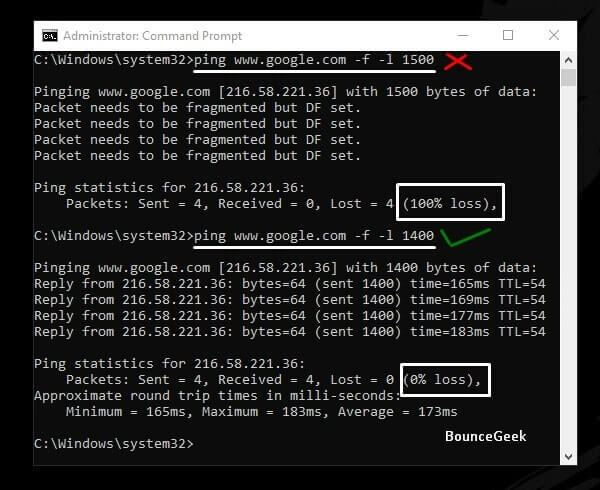 If in Ping test show 0% packet loss. It mean, that is the right MTU size for you. In my test perfect MTU size was was 1400. As you can see in screenshot, my correct MTU size is 1400. So, I need to add 28 to get optimal MTU settings. Now, I can change my MTU size to 1428. And, after that, error will not occurred again. To change MTU Size, Open Command Prompt (Admin). And, give these two commands. 1. First, Type netsh interface ipv4 show subinterface and press enter. 2. After that, type netsh interface ipv4 set subinterface “Wi – Fi” mtu=xxxx store=persistent and press enter. You need to replace Wi – Fi with the name appear in interface column. Also, instead of xxxx you need to type proper MTU size. 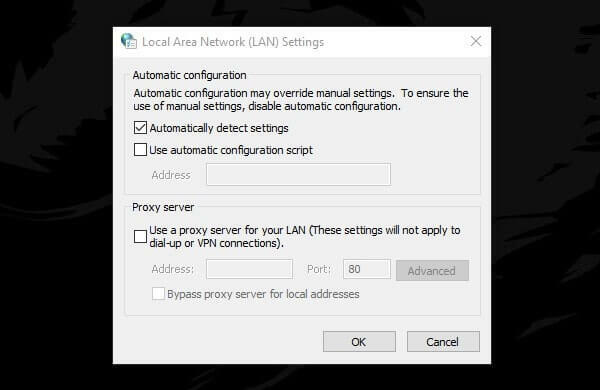 Solution 6: Check your proxy settings. This solution is only for LAN (Local Area Network) users. Google Chrome doesn’t come with socks/proxy settings. It uses socks/proxy of your Computer. 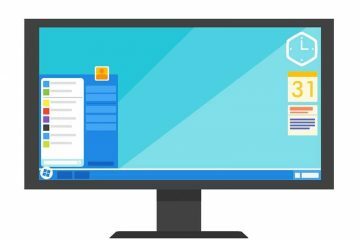 So, you need to make sure that, your Computer isn’t using a proxy server for your LAN. Open Control Panel, Click on “network and internet”. After that, Click on “Internet Options”. A Window will appear, Click on “connections” tab. And, after that, click on “LAN settings”. Now, make sure “use a proxy server for your LAN” option is unmark. If not then unmark it and then click on OK. And, “err_connection_reset” error will get resolved immediately. Winsock is an programming interface in Computer, that handles input/output requests for internet applications. To reset winsock, Open Command Prompt (Admin). Type the following command and press enter. That’s it. If problem was with winsock, then error will get resolved. As I mentioned at starting, due to sudden network changes this error occurs. And, network changes could happen due to VPN connection. If you’re using any software or VPN extension. Then, you need to uninstall or disable it. Solution 9: Disable WiFi MiniPort. 1. Do open Command Prompt or Windows PowerShell with admin privileges. 2. Type these two command one by one and press enter after each command. Solution: 10 Update Chrome and Network Drivers. It could possible that due to outdated network adaptors or chrome “err_connection_reset” error occurs. 1. To update network adaptor, Press Windows + X key then click on Device Manager. 2. 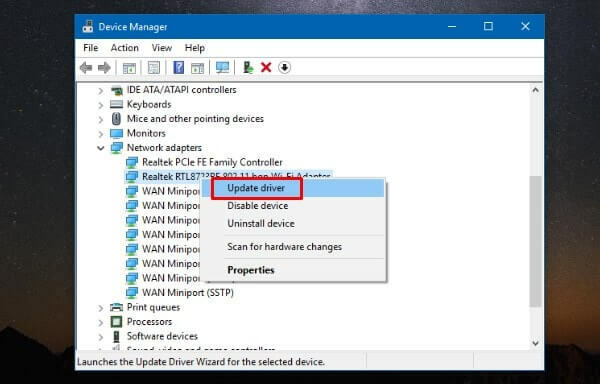 In device manager, Expand “network adapters”, then right click on WiFi adaptor and click on “update driver”. To update chrome browser browser visit help page of Chrome. Or, you can uninstall it first. And, then can download and install again from official site of it.